It isn't often that I fall in love with a gardening implement. But as I used the Bacho Long Handled Lawn Shears, I was grinning like a fool. I'd discovered the shears in an A. M. Leonard catalog, they looked to be the tool I'd been looking for. I contacted the manufacturer and asked if they could send me a pair. They shipped me the shears at no cost so I could try them out and tell you about them. As a gardener, I know the need for positioning oneself in a variety of poses in order to get the job done. From awkward twisted reaching to hope-for-the-best blind pruning, gardening claims its own special muscle groups. Many of us gardeners have reached a point in our lives when we certainly won't balk at using one or two assistive devices. I have a pair of Fiskars ergonomic hand pruners that really take the stress off my arthritic hands. 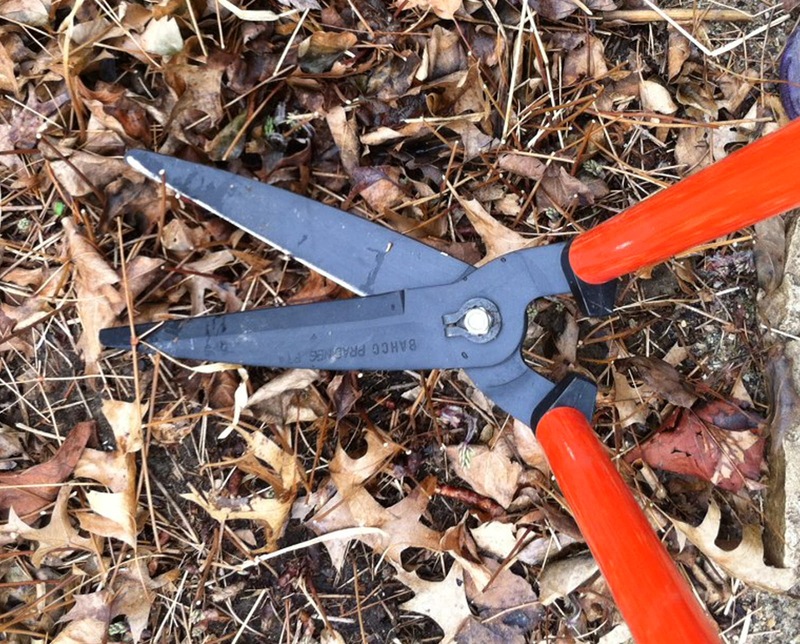 Although they don't seem to stay sharp as long as my old Felco 2's, they're great for light pruning of Clematis, and doing lots of deadheading. 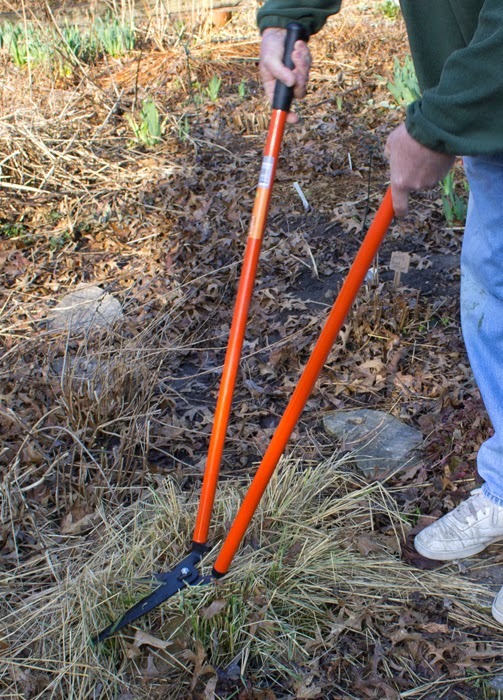 But the tool I'm in love with this spring is the Bacho Long Handled Lawn Shears Model P74 with horizontal action. When I first picked them up they felt kind of heavy, and it took some muscle to use them. But it wasn't my hand muscles! It was my arm muscles, and in a movement similar to a machine at the health club called a pec deck. The Bacho shears up close as they easily slice through Epimedium stems. Once I started comparing the effort required at the health club with the effort required by the Bacho Shears, the shears became much easier to use. I headed over to the Epimedium, where last year's leaf stems niggled at my sensibilities. They would detract from the newly-formed flowers that would be up in a couple of weeks, and I really didn't want to crawl around the ground to clip the 4-inch tall offenders. It all worked perfectly together--the timing of the flower emergence, the sharpness of the Bacho blades, and the ease of clipping the slender stems. The Bacho was great for snipping off last season's Hellebore leaves, Hosta flower stems, and a host of other perennials. The shears worked on ornamental grasses, as I've shown in this photo of my lovely assistant as he demonstrates. I had just about given up on ever finding a tool like this one and was looking around for a scythe, but imagined myself slicing off one of my toes with such a medieval object. I'm really glad I still get catalogs in the mail. Otherwise I would never have stumbled across this wonderful implement. It's come in very handy this spring especially, as I didn't do any clean-up at all in the fall. And who wouldn't love the fact that the Bacho Long Handled Lawn Shears are also a great, light weight work-out tool! So would I recommend the Bacho Long Handled Lawn Shears Model P74 with horizontal action? Not only can I recommend it, I give it an enthusiastic pec's up!